Koule tažného zařízení Ø 50 mm (černá nebo v zinku). Tow ball Ø 50 mm (black or in zinc). 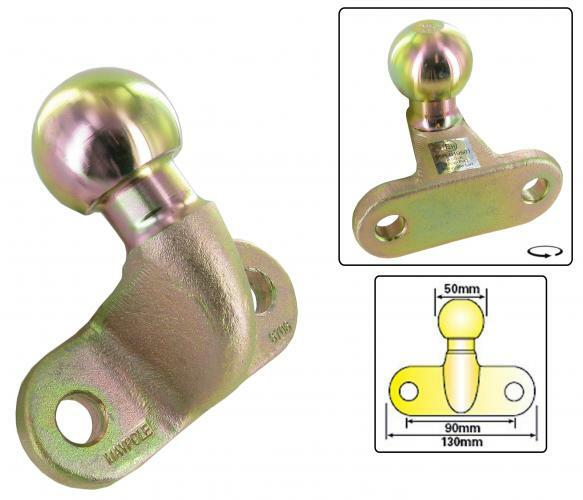 Trailer hitch ball, the most important part of a trailer coupling is the towbar ball, this will determine whether you the weight of the vehicle. The towbar ball features a European approval and therefore equipped with a nameplate. The maximum shot pressure of towbar ball is 200 kg (S-value) and the D-value (a derivative of the maximum trailer weight) is 17.2 kn. It is therefore the towbar ball along with the towing vehicle what determines whether the last may be drawn. If the type plate fog is the towbar legal seen as a UN approval and should not outweigh the trailer 750 kg. The width is 130 mm, the bolt distance is 90 mm, and the ball has a diameter of 50 mm. Please note: the tow ball must be mounted with M16 bolts which are not included. These bolts are loose at a towing bracket set or a complete trailer hitch included.